Dental implants are artificial roots (usually titanium) that are surgically placed into the upper or lower jaw bone by a dentist. The crown attached to the implant is very natural looking and often enhances or restores a patient’s smile! X-rays and digital impressions are taken of the jaw and teeth to determine bone integrity, gum tissue, and spacing available for an implant. We then map out the nerve on the 3D digital scan and plan exactly where the implant will go. While the area is numb, the implant will be surgically placed into the bone and allowed to heal and integrate itself for up to six months. Depending on the type of implant, a second surgery may be required in order to place the “post” that will hold the artificial tooth in place. 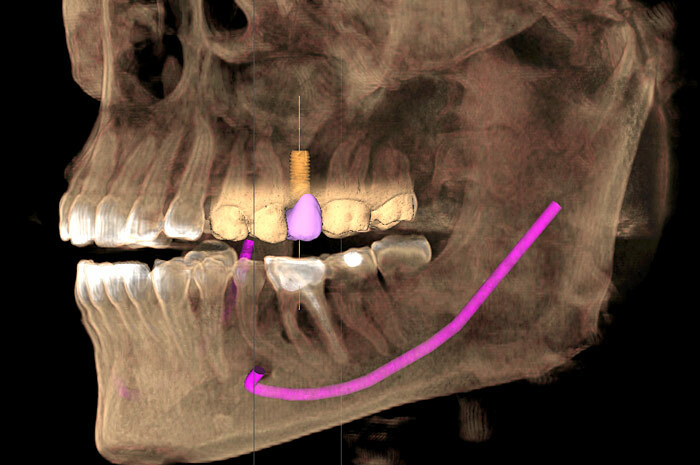 With other implants the post and anchor are already attached and placed at the same time. After several weeks of healing the artificial teeth are made and fitted to the post portion of the implant. After a healing period, the artificial teeth are securely attached to the implant, providing excellent stability and comfort to the patient.